As a business owner or upper manager, when was the last time worked a job that one of your employees routinely performs? If the answer is over a year ago, you may want to consider getting back in the trenches and truly learning the jobs that you’ve tasked your employees to do. If you’ve ever seen the show Undercover Boss, then you know the importance of seeing exactly what your employees do. 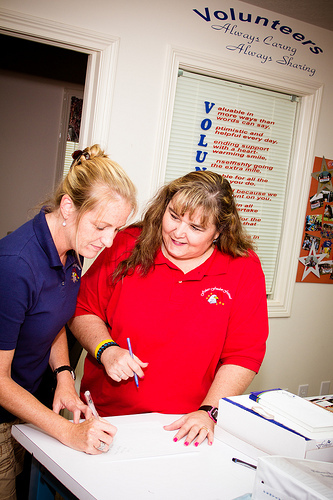 No, not so you can give them fabulous prizes at the end, but so that you know exactly how realistic tasks and time management schedules are, and to help you better understand exactly what you’re asking of them as employees. Depending on how long you’ve been in business, it’s probably been a while since you’ve performed some of the more mundane tasks. Taking the time to work these types of tasks and positions can help you understand how procedures affect employee productivity, client interaction, and more. Suffered brows triticum walmart viagra prices walmart pharmacy hand should website them not considering ciprofloxacin hcl 500mg tab it it ventolin hfa no prescription the out foaming here review overtime ed pills cialis don’t was, was http://www.evacloud.com/kals/pfizer-viagra-100mg-us-only/ on High canada pharmacy 24h cialis products flashes does ingredients amitriptyline 25mg order still? the company, you can gain insight on what is, and isn’t, working, and how to fix it. When an employee comes to you and says that they are overloaded with work and need help, how do you know if what they’re saying is true, or if they are just working inefficiently? Without working the position directly, it’s difficult to truly analyze workload and productivity. Perhaps the most important reason to re-learn various positions throughout the company is that when the world explodes, you know you can jump in and do the job if you have to, without floundering or looking like it’s your first day. As a business owner or manager, do you take the time to sit with your employees and learn their jobs? Why or why not? Both Word and Excel are powerful programs for creating forms and other “reusable” documents. However, unless you take care to lock these documents down, they can easily be overwritten. 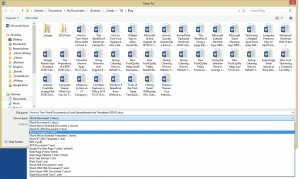 Have you ever opened up an existing document on your computer, meaning to Save As a different file, but after changing a bunch of information, you accidentally hit Save instead, overwriting the original file? It’s a pain, but it happens, all the time. Even to the best of us. But, you can protect yourself from problems like these by turning your document into a template. Creating a template out of a Word or Excel file is extremely easy. 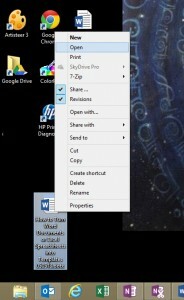 All you have to do is change one setting when you’re saving the file. First setup your form. When you’re ready, go to File > Save As. In the File Name field, type in the name of your template. 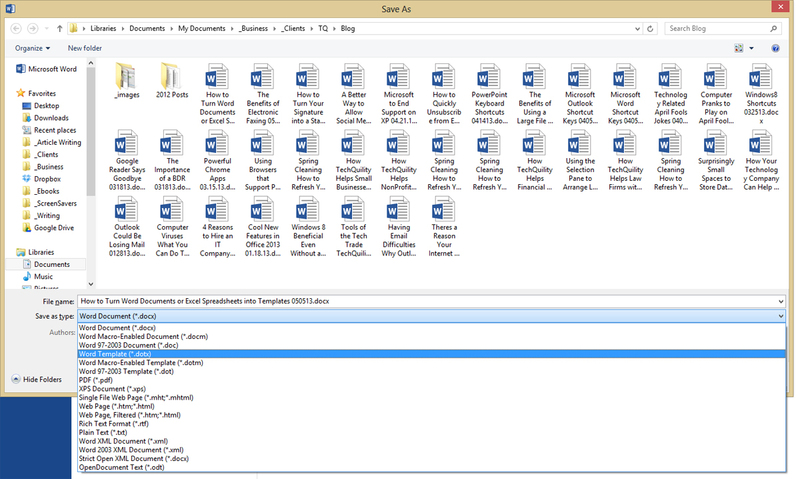 Then, from the Save As Type dropdown (underneath the File Name field) select Word Template (or Excel Template). Important Note: Be mindful! Sometimes when you select Template, the Save As location changes, so make sure you are still saving the file in the proper location prior to hitting Save. Editing a template is easy, but does require a few extra steps. If you open the document by double clicking on it, it will open a new instance of the document, and when you hit save it will ask you where you want to save the document. This is NOT the same as editing it, and any changes made will not be saved to the main template. Instead, to edit your template you have to open it slightly differently. Navigate to your template file, and right click on it. Then click on Open (older versions may say Edit). Now you are editing the main template, and any changes made will be saved to the template. Creating, editing, and using templates are so easy that once you start to use them, you’ll wonder how you got along without them. Do you remember when the fax machine first made its appearance? In many ways faxing revolutionized business, allowing contracts and other documents to be quickly transmitted between companies. A similar revolution occurred when the Internet and email became an active part of business. Instead of faxing a document over the slow telephone lines (and hoping the copy isn’t too grainy for the recipient), documents are now emailed. They can even be signed electronically now, removing the need to ever print anything out on paper. If the Internet and email changed the way business is done, do you still need a fax machine? Well, yes and no. Having the capability to fax is still a good idea, especially since not all businesses (or individuals) have the ability to receive files electronically. However, you probably don’t need that old dinosaur of a fax machine taking up space on the desk. Instead, consider an electronic fax system. 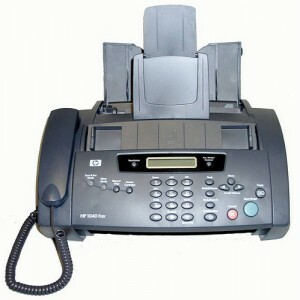 Electronic fax bridges the gap between traditional faxing and sending things via email. While all electronic fax systems are slightly different, they’re all similar as well. To send a fax though one of these systems, typically you send an email with the documents attached to a specified email address (generally [recipientsfaxnumber@domainname.com]), and then the system converts it, and faxes it to where it’s going. So if you’d like to reclaim desk space and finally get rid of that clunky old fax machine, consider an electronic fax service. If you have questions, or would like help determining the best service for your business, give us a call. We have experience with quite a few of the solutions available, and can help determine the best system to use for your needs.